See our Nikon shop for full range of Nikon products. Nikon 50mm AF 1.4 Nikkor Lens is fast enough for shooting in just about any type of light. Nikon 50mm AF Nikkor Lens produces distortion-free images with superb resolution and color rendition. Nikon 50mm AF Nikkor Lens is an ideal first lens, perfect for full-length portraits and travel photography or any type of available-light shooting. Nikon 50mm AF Nikkor Lens is one of the most widely used autofocus lenses in all of photography. Nikon 50mm AF Nikkor Lens is last enough for shooting in just about any type of light. Nikon 50mm AF Nikkor Lens weights only 9.0 ounces. Nikon 50mm AF 1.4 Nikkor Lens is an ideal first lens, perfect for full-length portraits, travel photography or any type of available-light shooting. 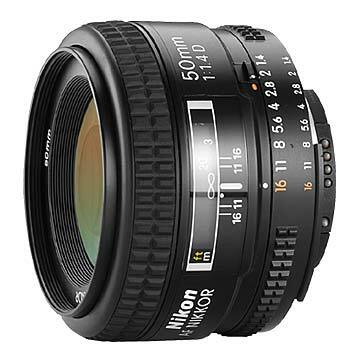 Nikon 50mm AF Nikkor Lens can be used in Film as well as digital cameras. Nikon is the only company in the world that manufactures their imaging products all the way from glass manufacturing to finished products. The spirit and technology to freely maneuver light are deeply embedded in Nikon's products. Nikkor is a lens brand for cameras that symbolizes the sprit of Nikon. The design concept of Nikkor such as: "100 year quality" achieved through the fusion of traditional craftsmanship with the latest technology; lenses of such quality that they are considered works of art reflecting the unique craftsmanship of the master lens makers; High image quality unique to Nikon that is both sharp and expressive; Styling so beautiful it brings a joy of ownership without sacrificing usability. The highly expected Nikon VR Lenses are professional-grade lenses that is specifically designed for portraits, studio and wedding photographers who need an ultra-fast, quality lenses with a large aperture for low-light circumstances. VR technology remove image blur caused by camera wobble, mainly when shooting in low-light conditions, permitting photographers to use shutter speeds up to three stops slower than they would normally use to obtain sharp, well exposed images. Prime lenses, are smaller, lighter and more compact than zoom lenses and tend to be faster, offering wide apertures of f/2.8, f/1.8 or even f/1.4. The large apertures let in more light, which benefits the photographer in a number of ways. Nikon Macro lenses ensure superior optical performance even at close distances that allows you to you take photographs that are 1:2 or 1:1 reproduction, which is ½ life size to life size respectively without the need for any additional accessories. It has both AF (Auto-focus) and MF (manual focus) mechanism. Nikon Macro lenses features IF "Internal Focusing" mechanism for quiet and smooth Auto Focus, yet the length of the Lens doesn't change during AF. Nikon's Micro-NIKKOR lenses are designed to perform their best from infinity all the way down to their closest focusing distances. Moving in extremely close to the subject using a Micro-NIKKOR lens lets you to fill the entire frame with your subject, allowing you to expand your artistic vision. Nikon Zoom lenses offers high-performance features in a solid body. Additionally they possess the shortest closest-focusing distance in its class - 0.33m throughout the entire zoom range. Nikon Zoom lenses are perfect for photojournalism and other all-purpose photographic needs. These elements convey an "authentic ambience" to its owner, and are passed from yesterday to today, and from today to tomorrow, with the aim of bringing greater joy of visual expression to people who take photos. For more information about, Nikon 50mm F1.4D AF Nikkor Lens website. Amazed how quickly I received the Camera Lens.This with the price.FANTASTIC !!! The postage was fast and well-packed. No problems.